First off, every climate presents itself with its own different set of challenges. Where I have my shop, in upper Michigan, we experience the extremes of every season. From 100+ degree summers to -40 degree winters. Needless to say, it’s a struggle to stay ahead of Mother Nature when it comes to vehicle care. I’ve put together a few tips to help you get a jump start on maintaining the best possible car protection for your vehicle throughout the changing weather. Have your bucket and mitt ready and start rinsing your vehicle from the top down to wash away any loose dirt and debris. Follow with scrubbing your car with fresh suds from top to bottom. Continue to rinse your wash mitt throughout this process. I also want to mention a product called a “Grit Guard” which is a screen that goes into the bottom of your wash bucket to trap loose dirt and keep it from making its way back onto your mitt which can mark your paint. 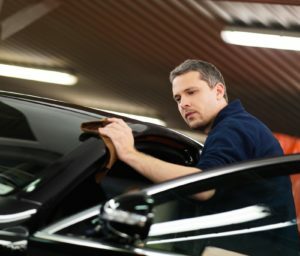 After your car is washed and free from dirt and debris you should be able to run your hand down the paint of your car and it should feel smooth. If you feel bumps or roughness on the paint’s surface, you can then do a clay bar treatment after the vehicle is dry. To do this, first spray the vehicle’s paint with a lubricant (I use 303® Speed Detailer) and wet the surface with an even mist. Then, rub a bar of clay across the paint surface in a straight line so that the contaminants are absorbed off the paint and into the clay. Next, wipe the lubricant off the surface. I suggest using caution for this process because, if done incorrectly, it can mark your paint. Also be careful that you choose the right clay! Now you can move onto sealing in and protecting all your hard work. I personally prefer to use an insulator wax. It is a semi-paste wax and a little harder to work with but it holds up quite well to what our harsh Michigan winters throw at us. In my opinion, improper washing, or lack of washing at all, are the biggest killers of wax. You’ll need the protective layer of wax on your car to protect the paint from road contaminates which can cause damage and rust on your car’s surface. I personally suggest avoiding drive-through washing stations as they typically use a “one-size-fits-all” type of cleaning application that can strip any protection from the surface of your car and can be acidic. This is why wax is your friend. It provides a buffer between that now perfect surface of your paint and all of the harsh elements that Mother Nature will inevitably throw at you. Finally we can move our efforts into the interior. A good shop vacuum and some elbow grease are your best tools at this stage. I recommend a diluted mixture of fabric softener and water misted into the fibers of the fabric carpets to allow finer grain gravel and dirt to be released and allowed to come clean. I like to use a paint brush and actually dust the plastic and trim dirt into the vacuum. Some spots may require treatment with an interior cleaner prior to final wipe down. Check out the Best Way to Apply Upholstery Cleaners to learn more about cleaning seats & fabric! Next up are the windows. I use a diluted mixture of isopropyl alcohol and water in a quick mist onto the glass. Then, I wipe clean with a dry, lint-free towel. Timing and pressure are the trick to a streak free window. Experiment with different mixtures, paper towel brands, glass towels, and more until you find what works best for you. Once the glass is done, you’ll need to protect the interior hard surfaces just as you would the exterior. Apply a thin layer of protection between the surfaces just as you would the exterior – you can do this with a product like 303 Automotive Protectant which will protect your rubber, vinyl, leather, and plastic surfaces while leaving a matte, dust-repellent finish. After you’ve gone through these six steps, then the best thing you can do is continue regular maintenance for ultimate car protection. The longer dirt sits on any surface, the more difficult it will be to remove. 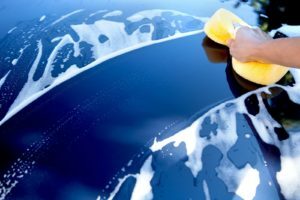 Following these tips will help you keep your vehicle shining, inside and out, for many years to come! This was written by Detailz. I use Florida sprinkler water to wash my car and it seems to take the wax off prematurely.Any suggestions. Contact us at marketing@goldeagle.com if you have any questions!